The NFL is all about the pass game and interior defensive linemen have to be able to rush the passer in order to garner first-round consideration. Only two players have shown that all-around ability to this point: Michigan’s Maurice Hurst and Washington’s Vita Vea. The players couldn’t be more different as Hurst is more of an undersized penetrator at 6-foot-2, 282-pounds while Vea is a powerful, athletic 344-pounder capable of holding the point and pushing the pocket. Hurst led the draft class with a pass rush productivity of 15.3 last season and he’s showed incredible production as part of Michigan’s loaded defensive line rotation. Vea looks the part of a two-down run stopper, and his 84.0 run defense grade in 2016 shows what he’s capable of, but he also graded at 81.9 as a pass-rusher and picked up a bull rush pressure every 20.2 rushes, second-best in the draft class. The Wolverine’s Hurst was the only interior defensive lineman to rank in the top-10 in both pass rush productivity (first) and run stop percentage (sixth). Washington’s Greg Gaines had the highest percentage of positively-graded plays against the run but ranked only 86th in the draft class in run stop percentage at 5.1 percent, showing that he was more of a disruptor who set up his teammates rather than a playmaker who lit up the stat sheet. 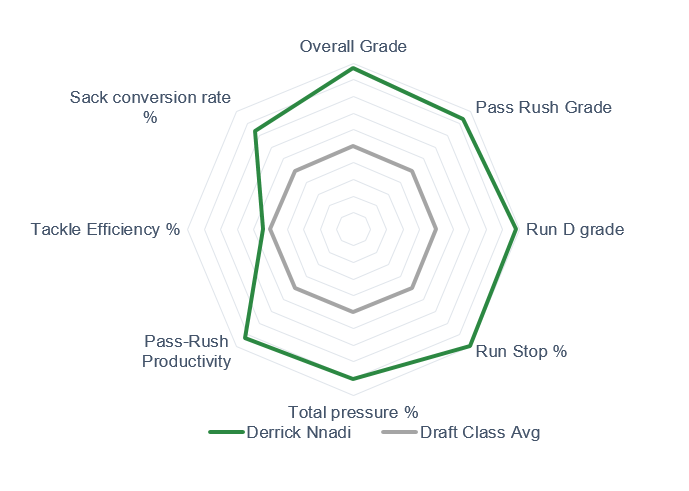 Florida State’s Derrick Nnadi had the eighth-highest percentage of positively-graded plays and the lowest-percentage of negatively-graded plays in the draft class against the run. Trenton Thompson, Georgia: Thompson stepped right in as a true freshman and showed he could handle SEC offensive linemen in the run game, and as a true sophomore, he picked up the fourth-highest percentage of positively-graded plays against the run while picking up only the second-lowest percentage of negatives. It’s all about getting after the quarterback now, and if Thompson can improve his 6.7 pass-rush productivity that ranked 36th in the draft class, he has the tools to move up draft boards. Christian Wilkins, Clemson: For Wilkins, this season is all about showing what he can do from his more natural position on the interior. He more than held his own last season while playing on the edge at 300 pounds, but if he can use his quicks to improve his pass-rushing numbers (six sacks, 13 QB hits and 37 hurries on 610 career rushes), he’ll hear his name mentioned as a first-round candidate. 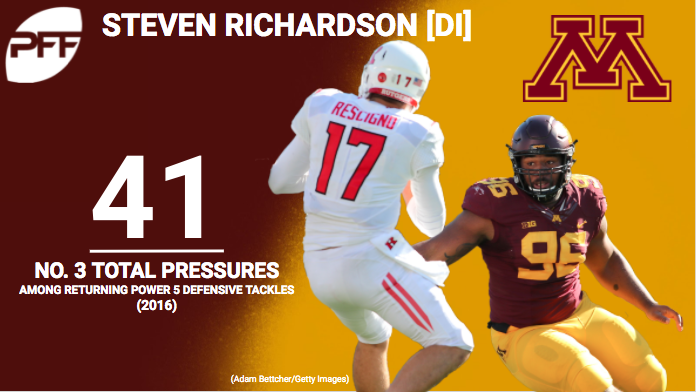 Steven Richardson, Minnesota: Undersized disruptors often fly under the radar but keep an eye on Richardson this fall. He had the third-highest percentage of positively-graded plays against the run in the draft class while ranking 16th in pass-rush productivity at 8.5. His squatty frame makes life difficult on opposing offensive linemen. Tim Settle, Virginia Tech: Settle has only 139 career snaps to his name, but it was an impressive limited showing. The 328-pounder has the athleticism to shoot gaps and the strength to hold the point, and he showed it in the run game where he posted the 13th-highest percentage of positively-graded plays against the run and 11th-lowest percentage of negatively-graded plays in the draft class. Throw in an impressive 10.3 pass rush productivity that ranked 10th in the class and Settle is ready for a breakout with increased playing time. CeCe Jefferson, Florida: The Gators continue to develop quality defensive linemen before sending them to the NFL and Jefferson may be the next name to know. He’s played only 787 snaps in his two years, but he’ll be counted on to be a movable chess piece up front this season. He ranked seventh in the draft class with a pass-rush productivity of 10.5 in 2016 while posting a solid 78.1 grade against the run. Cortez Broughton, Cincinnati: Broughton has showed continued improvement every year at Cincinnati, finishing 2016 with an impressive 85.3 overall grade. He avoided negative plays in the run game better than all but five players in the draft class last season while ranking 23rd with a pass-rush productivity of 7.9. Folorunso Fatukasi, UConn: It’s all about stopping the run for Fatukasi who is an old-school, two-gapping defensive lineman. He’s rarely moved in the run game, and he’s posted outstanding grades in that department for three straight years (85.7 in 2014, 82.6 in 2015, 86.1 in 2016). His pass-rushing took a step back last season, but he flashed his ability in 2015 with an 82.2 pass-rush grade and six sacks, three QB hits and 20 hurries. A return to that form will make Fatukasi one of the nation’s top all-around defensive linemen. 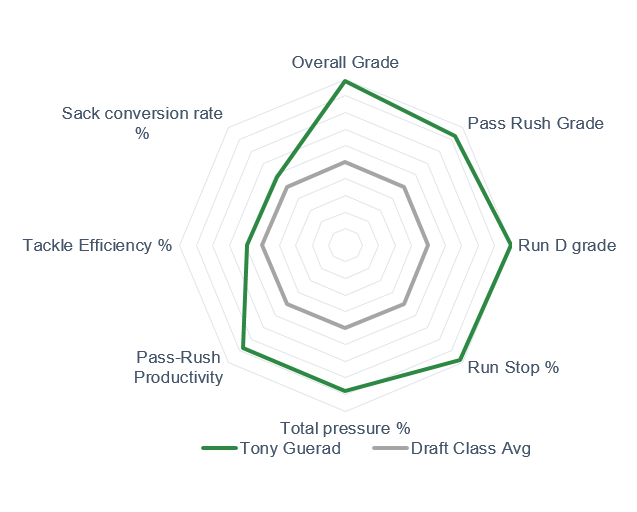 Tony Guerad, UCF: Guerad took a big step forward last season, ranking seventh in the draft class with a run stop percentage of 11.4 percent. While he disrupted the quarterback for 24 total pressures on 262 rushes last season, he can still do a better job of winning cleanly, and if he does take that step, he’ll be a dominant force in the AAC.